In a continuing series on fraud, this week’s column is about how to spot the signs that an employee may be engaged in fraudulent activity. Please see last week’s column, “Employee Tips Key to Fraud Prevention” for tips on decreasing fraud in your company. It happens every day. Employees are caught stealing from their companies. Then the messy business of uncovering the amount of money stolen, how it was taken and how to prevent it in the future begins. Fraud not only hurts businesses financially — an estimated $9 billion a year is lost to fraud in the US annually — but it takes a toll on the company in other ways. Employees are demoralized and time is lost to dealing with the results of the fraud. A strong fraud prevention program is critical. Part of that program should include managers being trained to be on the lookout for red flags that employees may be involved in fraudulent activity. Here are just a few of those red flags. Isn’t that great to have such a dedicated employee? Except that often the employee who never takes off is not dedicated to the company. That employee is dedicated to continuing to perpetrate the fraudulent activity he or she has begun, and doesn’t take off work because of the risk the activity may be uncovered. I’ve mentioned dear Aunt Tess in this column before. She was the beloved payroll clerk who showed up the day after she had major surgery to hand out the paychecks. In 25 years she hadn’t missed a payroll and a little thing like an appendectomy wouldn’t keep her away. Turned out she had to show up to handle the paychecks for her non-existent employees whose creation had allowed her to steal around $100,000 year from the company. Be wary of the employee who never takes off work. If a simple question about how an invoice is handled, or who double checks the list of vendors or changes to payroll evokes a defensive or irritated response, don’t back down until you get an answer. The same is true if the responses don’t make sense or sound unreasonable. Guilty people will act defensive when questioned about why they do things a certain way. Staying in the same position is not necessarily a bad thing, and many people enjoy staying in a job that they feel comfortable with for years. But if that person turns down opportunities to advance or otherwise better his or her situation in some manner, that can be a warning sign that they are afraid of being unable to continue their fraudulent activity or that it may be uncovered if they leave or change their position. If an employee starts talking about his new lake home, wearing an expensive watch or driving a new car with no explanation for his new-found wealth, that may be worth a closer look. If she starts acting more stressed at work for no discernible reason and claims all is fine at home, that could be a sign that engaging in the fraudulent activity is causing stress. Having financial difficulties can be a precursor to fraudulent activity. A law student in Atlanta was arrested for stealing more than $100,000 of jewelry at his part-time job at a department store. When he was caught, he said he did it because he had so much debt in student loans. Friendships do develop in the business world when we deal closely with each other and are often a source of pleasure in our work environment. However, an employee that seems to spend a lot of time with a vendor could indicate a kickback scheme that involves vendor overbilling. 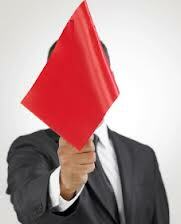 Be on the lookout for these red flags at your company. To learn more about why fraud occurs, read my next column later this week about the Fraud Triangle. This entry was posted in Fraud, Lessons for CEOs, Lessons for Success and tagged Lee Katz, Red Flags for Fraud, The Turnaround Authority. Bookmark the permalink.